CA Anti-Virus 2008 is a solid product that provides complete protection against viruses, worms and Trojan programs. This is built with WCL, ICSA and VB100% certified engine and is well equipped to find and clean any viruses that it finds on your computer. It costs around $ 39. However, this anti virus meets only general features, extra features like anti-spyware; anti-root kits, etc are available in their other products. If you have a specific need for just an anti virus program, CA Antivirus 2008 is a good option. If you like this product follows the instructions below to get a free one year license key. CA Antivirus 2008 is a good product for specific antivirus needs, the easy-to-use interface and automatic updates make it effortless to stay protected, and with quick scan and efficient use of system resources, it won't bog down your PC. 1. Go to this page and enter your name, lastname, select your country, email, verify email, password and confirm password respectively and click submit button. They will send you an email as shown below. 2 . Just click the link (see image). You will get a serial key and a download link to the product. But this is an Italian version. So you can download English version of CA Antivirus 2008 from this link / or from here. Even though this key is for 2007 version it is also work with 2008 version. 3. After installation, enter your serial number. 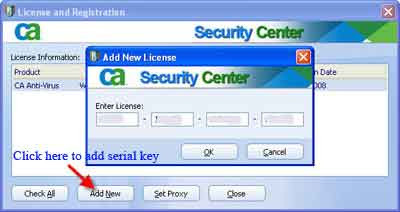 For this click help – view/update license - add new and enter your key. How can I update it with new key?